It's a quick trip back upstairs to restock on snacks and sunscreen. Catch up on email or just flip through a magazine out on your private balcony. Give the kids pointers (until they start winning). Duck into the kitchen to scoop ice cream without missing a minute of the movie. Lush landscaping makes it feel hidden away from the rest of the world. Your kids will love the "Play Days" activities program. Work on perfecting your swing at Pompano Beach Golf Shop golf course, 5 minutes away. Relax and unwind with a refreshing cocktail at the poolside bar. All one- and two-bedroom residences have balconies – perfect for enjoying a drink. It's a 23 minute drive to the dining and shopping at Las Olas Boulevard. Bonnet House Museum and Gardens is a 19 minute drive from the resort. 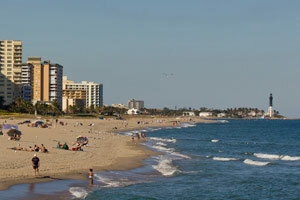 Ft Lauderdale Beach Park is a 21 minute drive from the resort. Tucked in among the tropical landscaping across the street from Pompano Beach, Wyndham Sea Gardens is in the heart of the Gold Coast, midway between Palm Beach and Miami. Four pools keep your mini-amphibians happy, and when you start feeling a little parched, the tiki bar saves the day with frosty umbrella drink. (The bartender’s your new hero). There’s a Play Days activities program perfect for keeping your crafters and contest-lovers occupied. Meanwhile, you can grab your racquet and channel your inner Serena, killing it on the clay tennis courts. Save an afternoon for pairing up on jet skis out on the water, then plan to grill out on the patio BBQs before heading for the outdoor hot tubs. Ask about the live entertainment schedule, but if nothing’s slated for the evening, race the kids back to claim spots on the sofa for family movie night. Group-friendly studio, one- and two-bedroom suites range in size from 390 to 1,200 square feet, comfortably sleeping four to six slightly sun-kissed travelers. Bacon may be your best strategy for getting everyone up and at ‘em bright and early. Do breakfast right in the fully equipped kitchen, flipping pancakes until no one can possibly eat another – not even the silver dollar size. For lunch, feel free to play the vacation card and pick up lunch at the onsite deli. Mustard mishap? Access to a washer/dryer means you can take care of it sooner vs later. Evenings are best spent in the cozy living room, cultivating the next generation of board game champs, or singing along to The Lion King for the umpteenth time. Big local events include a holiday boat parade in December, seafood festival in April and fishing rodeo in May. Plus, Pompano Beach has a 1,000-foot fishing pier and more than 50 local parks, so it’s easy to spend your days just kicking around town. If the clouds happen to hijack one of your beach days, consider it the perfect opportunity to visit the 21,000 square foot Museum of Art – two floors of rotating exhibitions and permanent collections showcasing American, European modern, contemporary and Cuban art, plus some Picasso ceramics. If you want to see more of the surrounding area, take your crew on a swamp buggy tour of the Everglades, catch a tribal event at a Seminole Indian reservation, or pack a picnic and go climb the historic Hillsboro Lighthouse – a well-worth-it 175 spiral steps up. One of the oldest structures in Broward County, it’s only open about once a month, and only accessible by boat, so ask at the resort before venturing out. Just north of Fort Lauderdale but with a more relaxing atmosphere. Have a picnic at one of Pompano Beach’s 50 local parks or take a stroll down Pompano Municipal Pier. Stretch out in the sun anywhere along three miles of sandy beachfront until sundown, then head to the Isle Casino if you’re feeling lucky.